One of the coolest aspects of tree planting in my opinion is the camp's bus. It's like the Statue of Liberty but for a tree planting village. 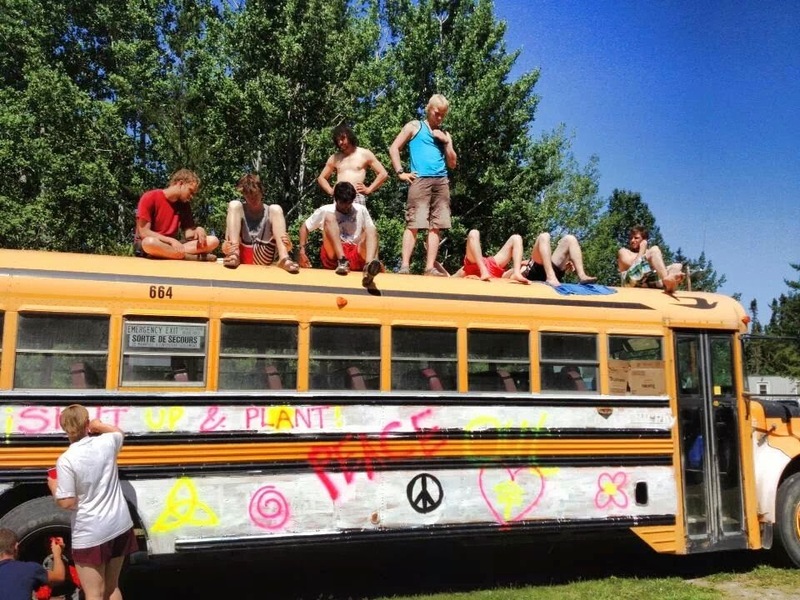 Nothing gets 30 or 40 people crammed together down dirt logging roads in the middle of nowhere better than a beat-up old school bus that smells like death itself, and has pieces falling off over every bump in the road. Sometimes when a section of road has been washed away, planters actually have to build a bridge to get the bus across. It's hard work maintaining these buses, but if you take care of them they take care of you. 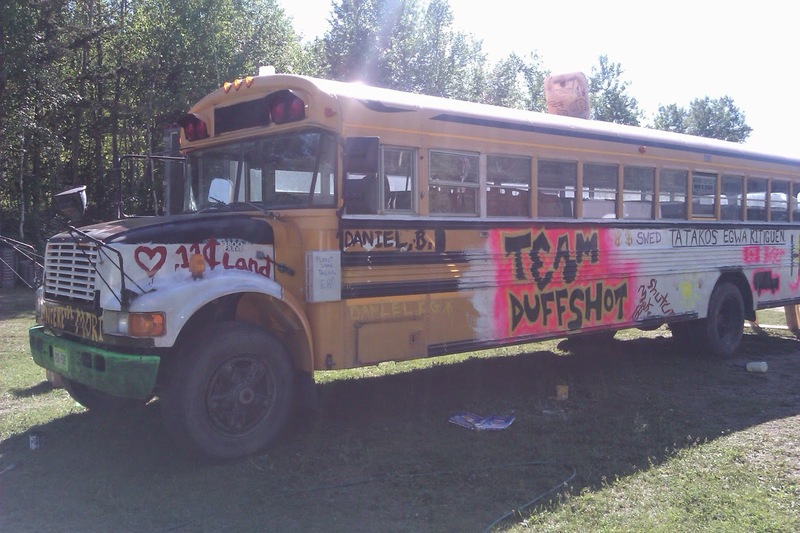 With a camp bus comes a sense of pride. Every year planters can paint their bus with anything they'd like (barring obscene profanity, usually), adding to that feeling of pride. 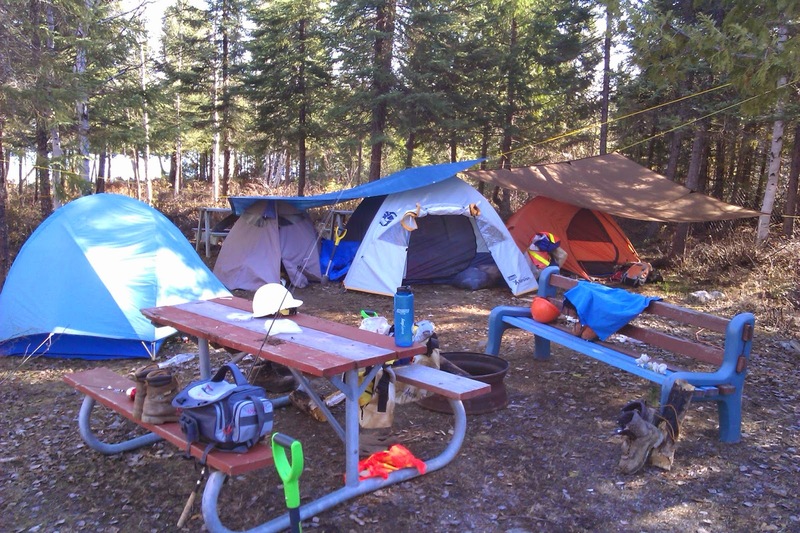 it also provides a great camp activity for a weekend. Both the outside and the inside get spruced up (spruce, like spruce trees, hilarious, James!) On the inside planters write messages, both to themselves and to future planters, messages like "veterans don't fear the Reefer," or "picking up dimes" (a metaphor for planting trees at ten cents each) or the one below, which was one of my favorites. Often these messages are inspirational or humorous, bolstering a planter's mindset. 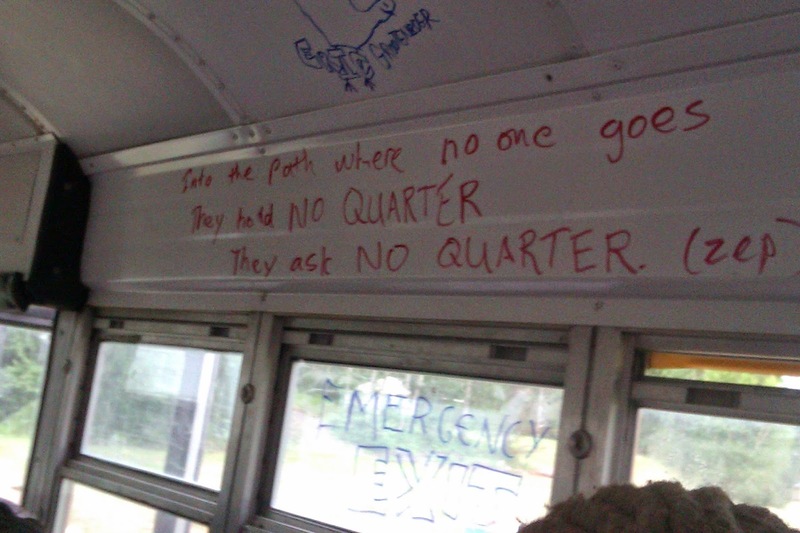 The bus is what gets planters away from camp on weekends. Some of the greatest road trips I've ever had were on tree planting buses. The sun's shining through the grimy windows, everyone's in the weekend mood, somewhere on the bus Outkast is blaring on a small portable speaker and we're heading on into the next small town, or pulling up to some tucked-away lake in the middle of nowhere. Not only is the bus great for getting planters to and from work, it's also great to have around camp. 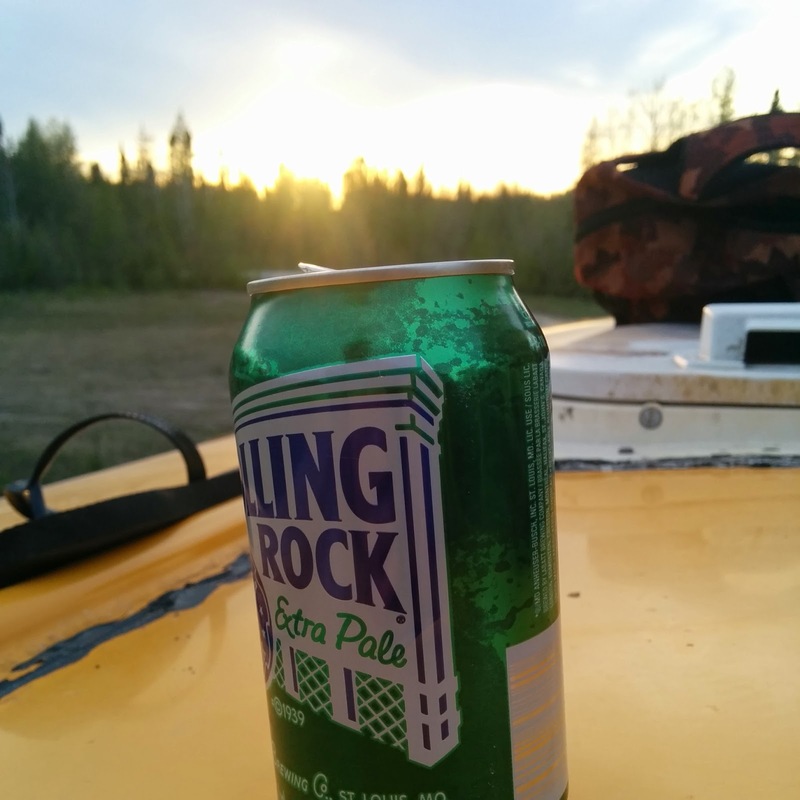 I can't count the number of evenings I spent on the roof of my camp bus with my friends during my contracts. There's something relaxing about being up there, watching the sun set and the stars come out, listening to the wolves howl. These are magical moments, and that beat up old bus is an integral part in what makes it so special. It can even offer shelter, should a planter make the unwise decision to sleep in the bus for the night. While it may seem like a great idea in theory, when you're trying to sleep while suspended between two bus benches you find falling asleep a bit difficult. Trust me, I tried very hard. So maybe the bus does smell awful. 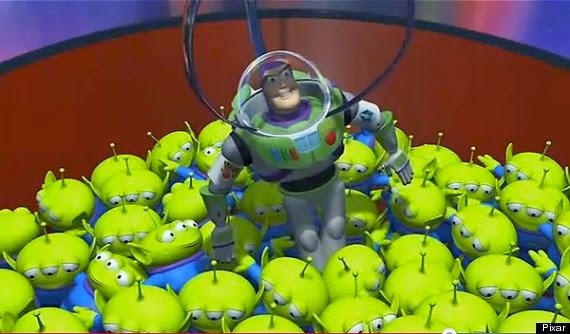 Maybe the seats are too small for a large group of adults. Maybe it's vital organs are falling off on old dirt roads. There's something special about that bus. It's a part of the tree planting family, almost a planter itself. For a first time planter, one of the most confusing part of the job is learning the tree planter slang. Slash, screef, reefer, high-baller, duff- what does it all mean?? It can feel as though you've been thrown into a foreign country, and everyone around you is speaking a totally different language. Although it can all seem so confusing at first, most of the words you'll pick up within the first few weeks of planting. I'll give you a head start and go over a majority of the words here. The Block: This is the land that is being replanted. Tree line: The edge of the clear cut, also the back boundary of the planting land. Cream: The good planting soil, always hunted by planters. It can also be called peanut butter, but that's more of a personal choice. Duff: Duff is a layer of decomposing organic material that can be found above the good planting soil. It can contain decomposed moss, leaves or sticks, and cannot be planted in. It is usually kicked out of the way by planters, which is known as screefing. 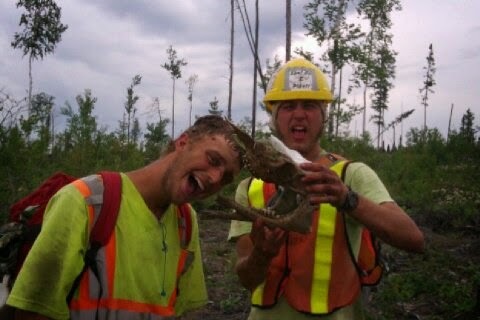 Screef: Screefing refers to the act of removing the duff from the creamy soil that a tree needs. This is usually accomplished by kicking it aggressively. 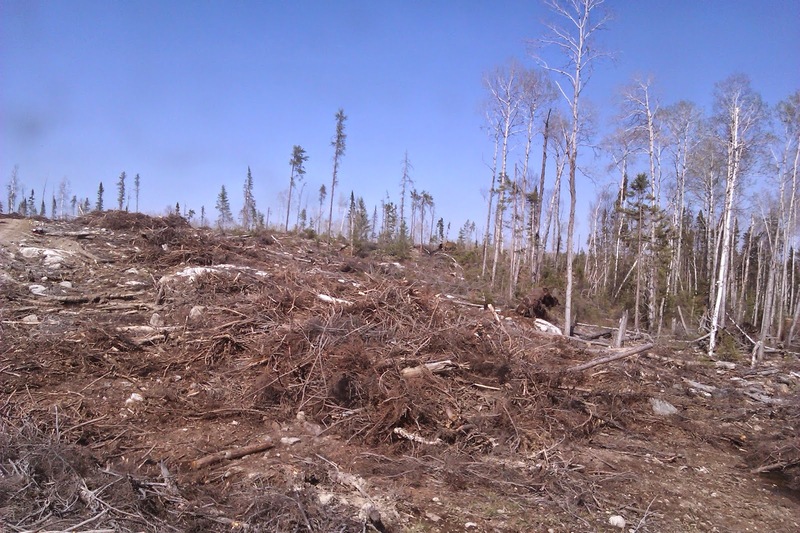 Slash: When trees are cut down in the logging areas, not all of them are collected. There are fallen trees scattered around the planting area, providing more obstacles for planters. Stumps, underbrush and branches also qualify as slash. 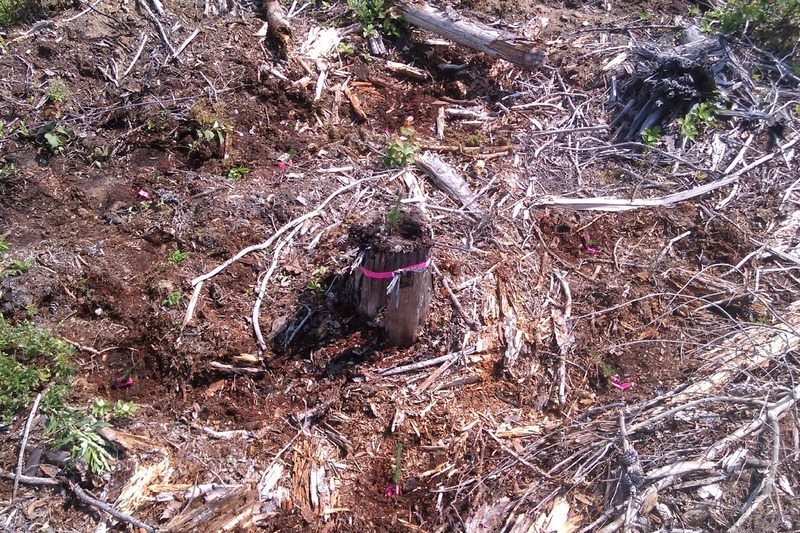 There are also slash piles, which are piles of logs left beside the logging road, which becomes the planting road. Planters have to walk over or around those piles to get to their land, which can be time consuming. Red Rot: Decomposing wood that can cover the soil, always a red color. Highballer: The people on the planting crew who plant the most trees consistently. Tree Runner: The person on the crew who brings trees to the planters. They have to make sure every planter has trees to plant at all times. Reefer: The 18 wheeler used to hold all the trees before their planted. They have built in refrigeration to keep the trees cool. Bag Up/Out: The act of filling the planting bags with a few hundred trees, and running out of trees after planting them. Planter's slang is pretty weird, but it does make sense when you experience it every day. Chances are that over the course of a two month tree planting contract planters are going to get hurt. It's inevitable really, with the number of hazards that lie waiting in the untamed forests. Camp supervisors are trained to deal with these injuries, and planters are taught how to avoid getting hurt, and usually big injuries are few and far between, if they even happen at all. But there are smaller injuries and symptoms of tree planting that are commonplace, and although not particularly dangerous, can make life a little less enjoyable. I've put together a list of some common ailments that most planters have dealt with before. Christmas Toe- Christmas Toe isn't as fun as it may sound. Everybody loves Christmas, but nobody likes Christmas Toe. Essentially it is a numbing of the big toes, caused by an excessive amount of walking on steep or uneven terrain. 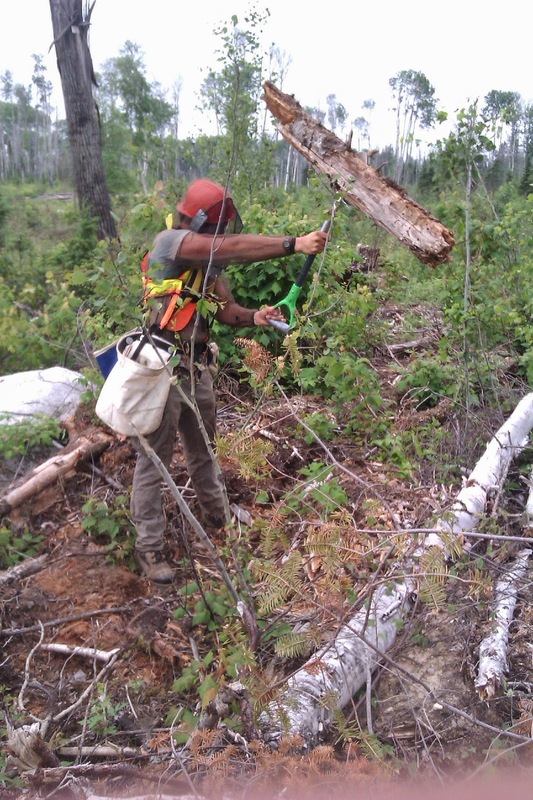 It typically happens to hikers who spend a lot of time hiking in extreme environments, but is found frequently in tree planters and other forestry workers. How did it get such a fancy name you ask? Because the feeling doesn't come back to your toes for about four to six months, or the time between the end of a tree planting contract and the holiday season. In my first year the feeling didn't come back until mid-February, seven months after I planted my last tree of the contract. It's not dangerous, and doesn't affect your balance at all, but it can be scary to a rookie planter not expecting it. Once you get used to it, it's a great conversation starter at parties. The Claw- No this doesn't refer to an arcade game at the local Chuck E Cheese. The Claw is what happens when the fingers on a planter's hand used to pound the shovel into the ground all day long become difficult to extend, giving your hand a claw-like look. It's not painful but it does look strange, and can last about a week after planting. During the morning it is at it's worst, with fingers almost locked in a fist, but after stretching them for a bit the movement comes back almost entirely. cause of cramps while tree planting is dehydration. During the day, the temperature can rise above 30 degrees Celsius, and without clouds or shade planters are in the sun the entire day. Without enough water, planters can suffer excruciating leg cramps, which can put them out of commission for hours, if not the whole day. I remember my first year one of our best planters was so dehydrated at the end of the day that he had to lay on the floor of the bus because of the pain. The best way to combat cramps is simple: keep drinking. If you've ever experienced something similar to any of these injuries leave a comment, I'm curious if anyone outside of the tree planting community can relate. At this point I felt the need to clear something up that may not have been obvious in my previous posts. Maybe I made tree planting sound like a prison sentence, filled with endless days of hard work. There's definitely hard work involved, and some longer days may feel like a prison sentence, but planters are given a day or two off every week to relax. So how does a tree planter spend his or her downtime? 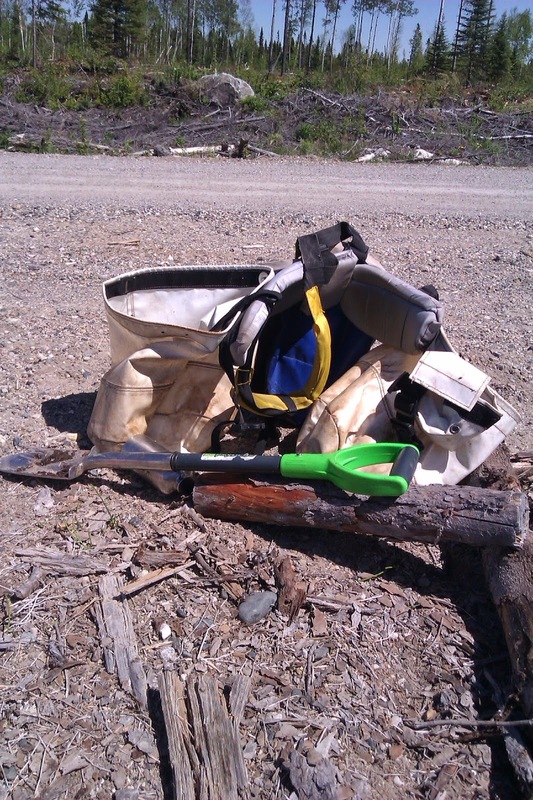 A tree planters' weekend spans Sunday and Monday, not the standard weekend format. 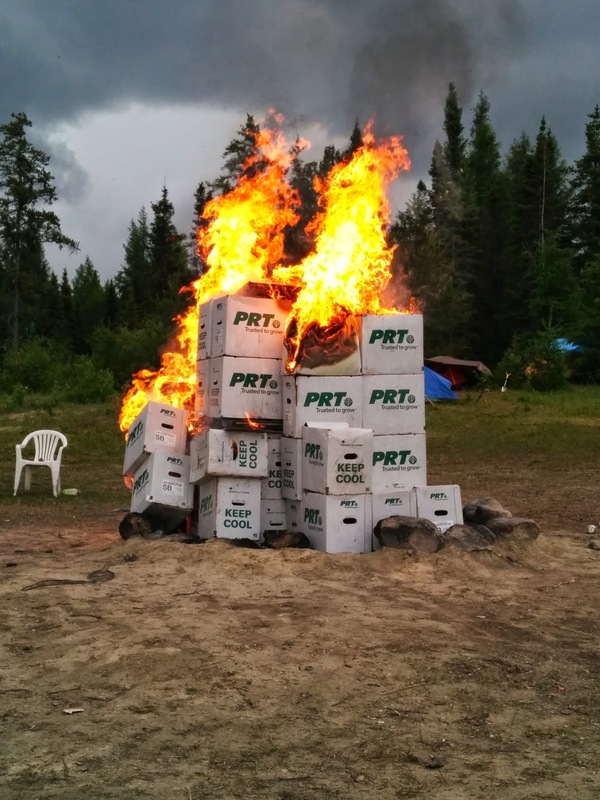 Generally Saturday night after planting and dinner is spent socializing around a bonfire, usually bigger than it needs to be, sharing stories from the week, having a drink or two and just unwinding after a long week. These evenings can go late into the night, sometimes until early morning. Sunday is typically the day everyone goes into town on the bus to do laundry, buy food for the weekend and enjoy civilization for a change. Maybe use a real toilet instead of an outhouse for a change. 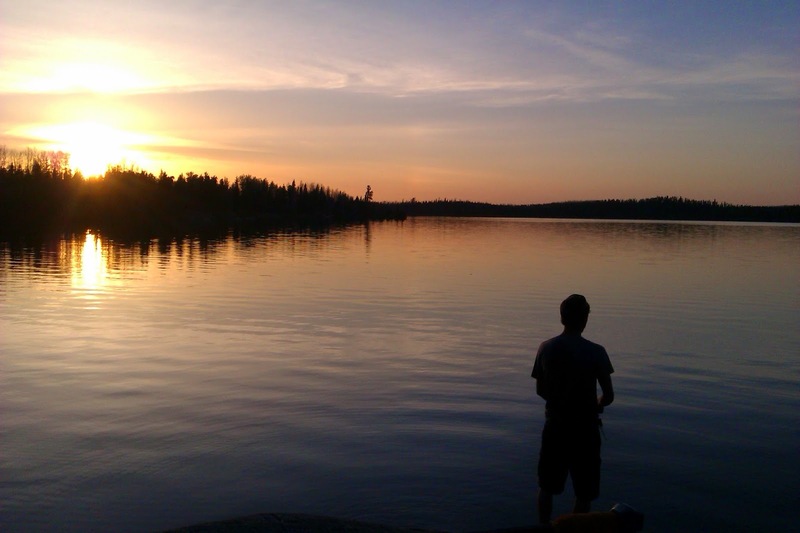 I liked to use that time to call home, since cell service out in the woods is hard to come by. After everyone's ready to go back the bus collects everyone and heads back to camp. By now it's usually later in the afternoon, so most planters will make dinner. Sunday evening is spent much like Saturday evening, with a big fire and a social evening with the entire crew. Have time off? 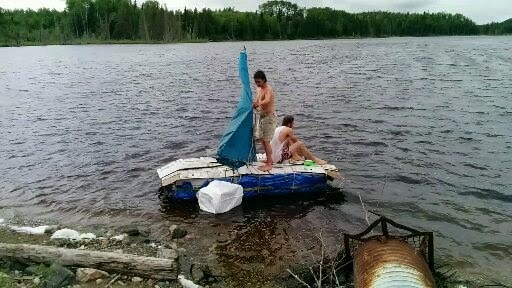 Why not build a boat? Monday is the day to totally relax. There's no need to go into town again, so the time is yours to spend how you you'd like. Go fishing, play some volleyball, write a letter to a loved one, etc. Mondays are the most relaxing days to a tree planter. You don't even have to wake up if you don't want to. The latter portion of Monday is used to prepare for the following work day. Gear is packed, boots are cleaned, shovels are sharpened. A sense of the coming work week is in the air. But don't worry, we'll do it all again next week. In my last post I went over just a few of the items you'll need to have a successful tree planting contract. Now I want to finish off the list by going through some of the clothing and other items you'll want to have. Clothing can be a personal choice with a planter, but all outfits have one thing in common: they're going to get dirty, torn apart and ruined forever. Value Village is a tree planter's paradise. That's where we load up on old tee shirts, over sized sweaters, toques and wool socks. Oh, and keep an eye out for long underwear. Not only can you wear it at the beginning of your contract when it will be below zero in the mornings, when it warms up you can wear them under a pair of shorts to keep the bugs and underbrush from slicing up your legs! I recommend two to three pairs, as they start to smell after a week. Nothing comes in handier at a tree planting camp than duct tape. fix tent holes, fix clothing holes, fix any holes really. It can also be wrapped around the fingers of your planting hand, the hand you use to put the tree into the ground, giving you some protection and a better grip on the tree. Bring a roll or two, it always comes in handy. PPE refers to safety reflective vests and helmets. These are required by law in Ontario and Alberta, although in British Columbia the rules are much less strict. PPE vests and helmets can be found at any construction equipment store, and are not very expensive. As long as they are safety approved you can use them. This refers to the host of small items you'll want. Just briefly I'll put down a list of some things to think about taking. Hopefully this list gives you an idea of what you'll need should you ever find yourself in a planter's shoes (or boots). And be sure to bring something to do on your days off. A fishing rod, books, some music or even board games are all fantastic when you don't have to work. Once you've gone once you have a pretty good idea of what to bring the next time, should you choose to plant trees again, and you might think of something to bring that I failed to mention. Congratulations! You've been hired to plant trees this summer and will now commit to spend two months in the middle of the woods somewhere far away from the rest of humanity. Now what are you going to pack? Here's a list of some of the important items that you'll want to take with you. I'm only covering the main necessities in this post, next week I will post a second list. 1. Steel-toe boots. During a tree planting contract you'll be wearing them almost the entire time. They must have steel toes by law, since half of the job requires you to stomp on the base of your trees to ensure they are planted firmly and won't get washed away by rain. They should also be waterproof. Guaranteed you'll be walking through puddles or mud almost every day. The best boots I ever had were chainsaw boots, designed for lumberjacks. They're 100 per cent waterproof and will last the whole contract for sure. 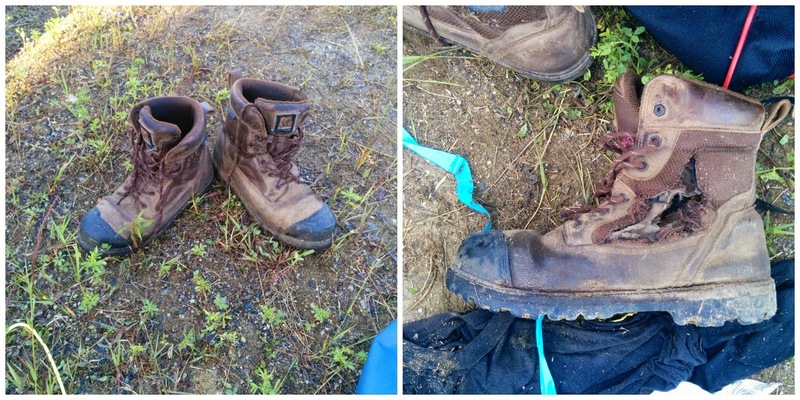 Below are the boots I bought in 2014, just steel toed hiking boots. By the end of week two the hole you see in the right photo had already started. When water gets in your boots your whole day is ruined. DO NOT CHEAP OUT ON BOOTS. They are your best friends in the woods. 2. Shovel and bags. A tree planter's weapons. Virtually all planters use the same standard bags and shovels. The shovel is about 34 inches long, but can be shortened easily, which many veteran planters do. They come with either a wide spade or a thin one. I recommend the thin blade, but it really comes down to personal preference. The thin spade gives you a lighter shovel which is easier to make a hole with. The wider spade makes a bigger hole, which can be useful but I found it slows me down slightly. The bags cannot be modified much. They are set up to have two shoulder straps and a waist strap to evenly distribute weight. There are two main bags, one on each hip, which are designed to hold your trees. A small back bag can hold your water bottle, bug spray, and whatever else you want to bring out with you. 3.Tent. Yes that's right, you'll be living in a tent for two months. When told that, most people look at me like I'm insane. Maybe so, but I find it almost therapeutic. Either way, if you're going to buy a tent, I suggest buying a larger one. 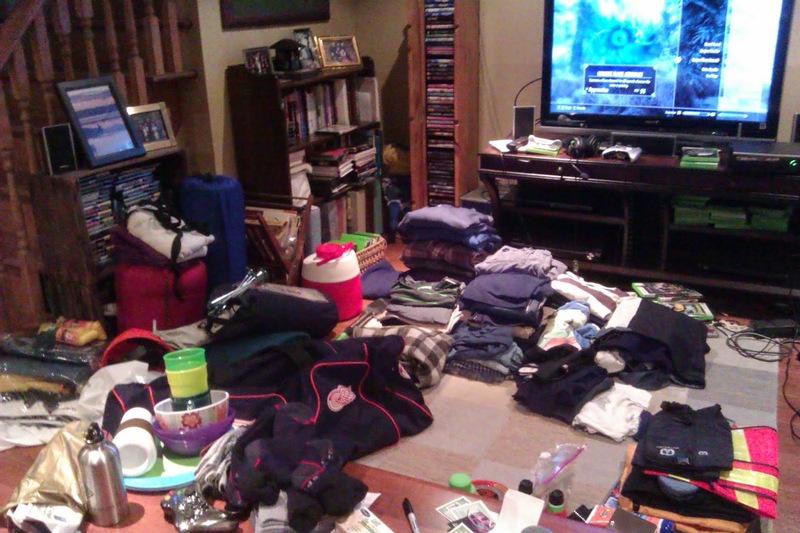 Sure, it takes up more room when you're packing, but keep in mind it's your home now. I've used a four man tent on both of my contracts and I love it. You can store all your belongings in it and there's still plenty of space for you. Again, it's up to you personally, but makes sure your tent is in good shape, and won't let the bugs in. Once the bugs are in, it's game over. I hope this quick guide to the essentials helps! As I said earlier, I will be posting a second list next week which will cover clothing and other essentials. In my first post I talked about the challenges a planter faces every day. Obviously it isn't a job for everyone. 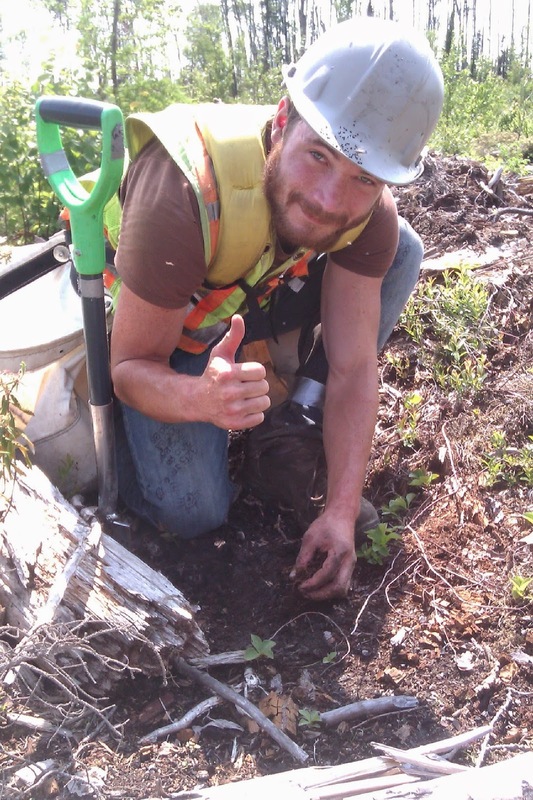 You might be wondering what it takes to be a tree planter. What does a planter look like? It may surprise you that there isn't a certain type of person that goes tree planting. They come in all sizes. Being tall or short has no effect on ones ability to put trees in the ground. Gender is also irrelevant to ones planting abilities. In fact, many of the best planters I've met are women. There are some things that all good planters have in common. The first is endurance. It's a difficult job, so a planter has to be in good shape to keep up. Even if you're only in decent shape, a week or two of planting will give you the endurance you need. In addition to endurance, a good planter needs determination. If you apply to a job where you'll be living in a tent working hard for two months, you'd better be ready to stick it out rain or shine. It's not easy to keep going, but the rewards are there. I've never felt more accomplished, more proud, than when I put my last tree in the ground and finished my first contract. It's an indescribable feeling, one I'll always remember. An optimistic attitude will also serve you well. For a group of men and women doing some of the hardest work in the country, there's remarkably little complaining to be heard. The phrase "shut up and plant" is one you'll hear a lot over the planting season. Whining is poison to a crew. Learn to enjoy yourself, laugh a lot and the job doesn't seem so bad anymore. Lastly, a planter enjoys life in the outdoors. For two months the closest thing you have to a home is a tent, so you'd better enjoy being outside a lot. Other than that, there's no real set characteristics of a tree planter. I'm a tree planter and Public Relations student. If working in the great outdoors interest you give my blog a read!